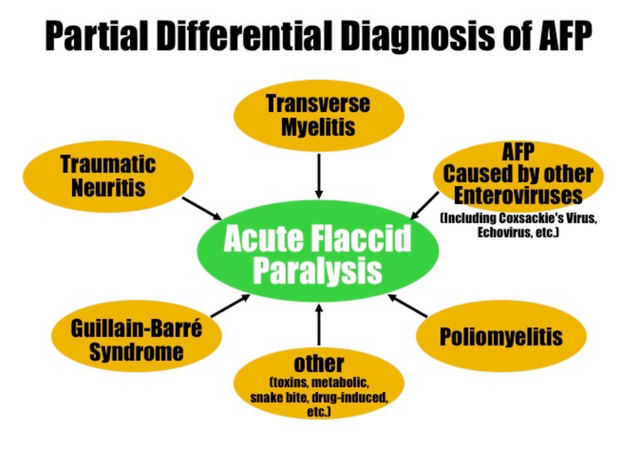 CDC confirms 62 cases of Post-Polio illness or Acute Flaccid Paralysis (AFP)! 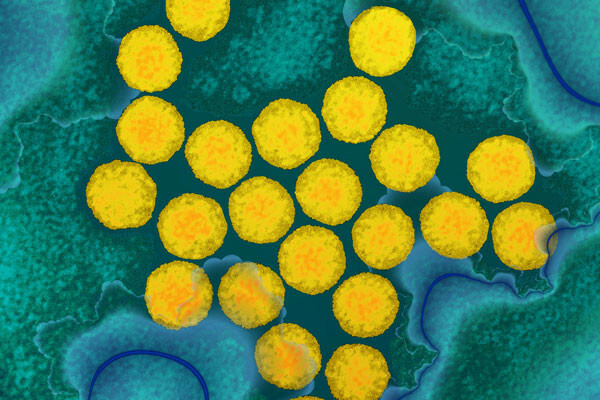 The Centers for Disease Control and Prevention has confirmed 62 cases of a post polio neurological condition called acute flaccid myelitis, also known as AFM. So far this year in the U.S. more than 90 percent of the cases involved children 18 or younger, with an average age of just 4 years old. AFM is an illness that affects the nervous system, specifically the area of spinal cord called gray matter. It causes the muscles and reflexes in the body to become weak or even paralyzed. 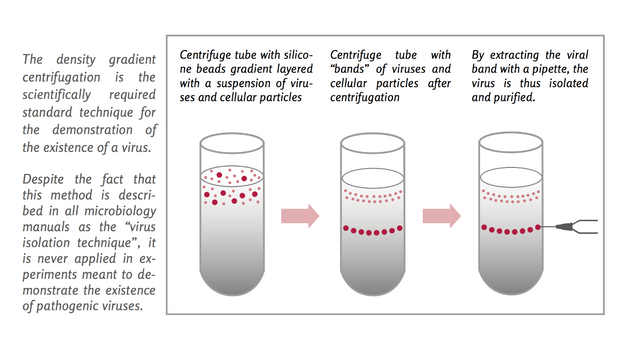 Cases of AFM are characterized by a sudden onset of arm or leg weakness and loss of muscle tone and reflexes. Its symptoms are identical to those of poliomyelitis or polio which is associated with a so-called virus. 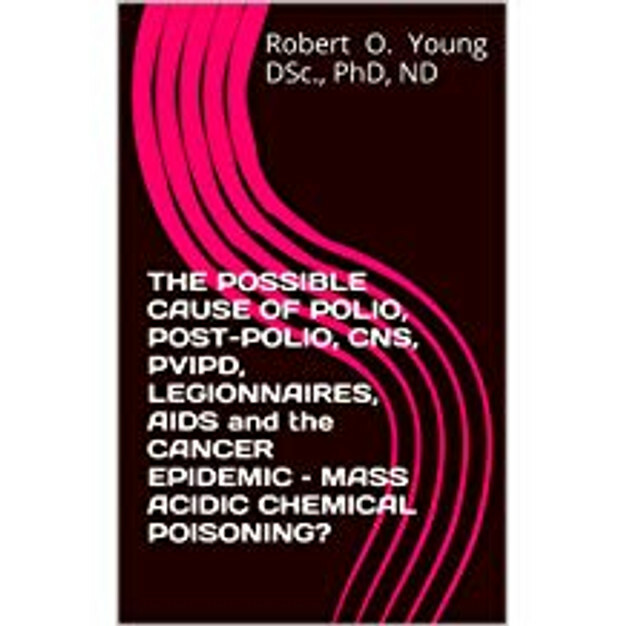 Years of research have shown that these cases of polio and post-polio are associated with chemical poisoning or organochlorines used as a pesticide in farming found in all of our food sources (except for organically grown food). 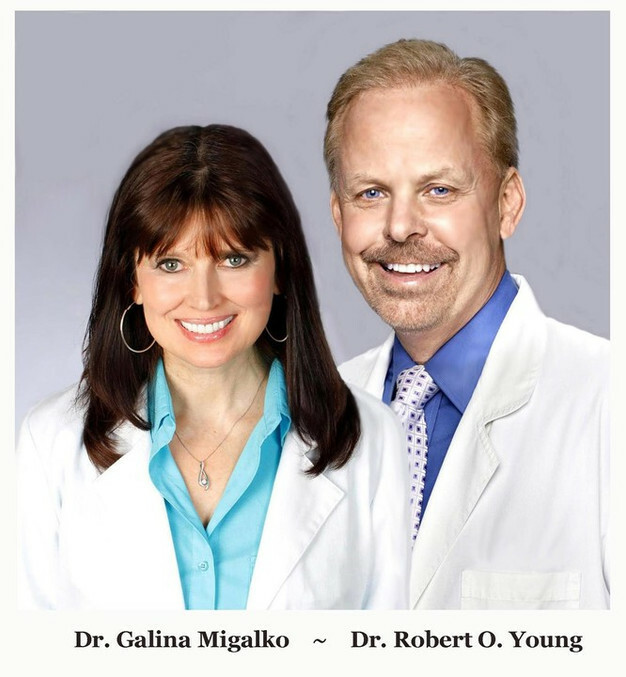 Additional symptoms can include facial drooping or weakness, difficulty swallowing and slurred speech. This condition, which may be caused by acidic poisoning from DDT like chemicals found in all non-organic fruit, vegetables, poultry and meat can lead to paralysis and even death, but no deaths have been reported so far this year. The above graph is a compilation of new cases per year (not incidence, as portrayed elsewhere herein). The data for the last half of the 20th century was gathered from U.S. Vital Statistics. The very earliest numbers, from 1887 to about 1904, and the post polio numbers, are interpolated from the general historical commentary regarding those periods. (see bibliography on Homepage and NYC Health Commissioner Haden Emerson’s compilations). While the graph is not perfectly accurate, due to changing methods of diagnoses and record-keeping within the medical system, it does give a reliable overall picture of Polio cases in terms of known literature and records. The source for the U.S. and Swiss discoveries of paralysis in calves is from Van Nostrand’s Encyclopedia of Science and Engineering (1995), vol. 5, p1725. The phrase “Pesticides as a Panacea: 1942-1962” is a subtitle found in Encyclopedia Britannica, Macropaedia (1986). Refer to other graphs (Overview) for specific pesticide comparisons with Polio incidence. The sudden surge of chlorobenzene production coincides in time and place (1915, Niagara Falls) to be considered as probable cause for the epidemic of central nervous system diseases that followed the next year in the New York City region. This epidemic lasted only six months, June to November, with 82% of the cases occurring in just 8 weeks. While Polio literature terms this a world-wide Polio epidemic, it was peculiarly a phenomena of the U.S. and was especially prominent in the New York City region. This is strange behavior for a supposedly so-called predatory Poliovirus, in an era, a continent, wholly unprotected by so-called miracle vaccines! DDT and “DDT-like chemicals” are used to represent the major organochlorine pesticides and organochlorines of similar neurotoxic character. 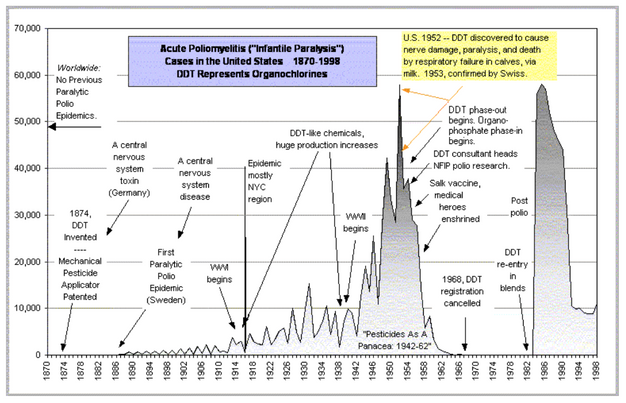 Most of the industrial organochlorines can produce CNS disease symptoms similar to Polio. [Refer to Tables 2, 3, 5, 6, 7, 8, 9,10 and 11] below to see the relationship between DDT and DDT-like chemical production and the incidence of Polio. Just over three billion pounds of persistent pesticides are represented in the Table 2 above and 3 below. Virtually all peaks and valleys correlate with a direct one-to-one relationship with each pesticide as it enters and leaves the US market. 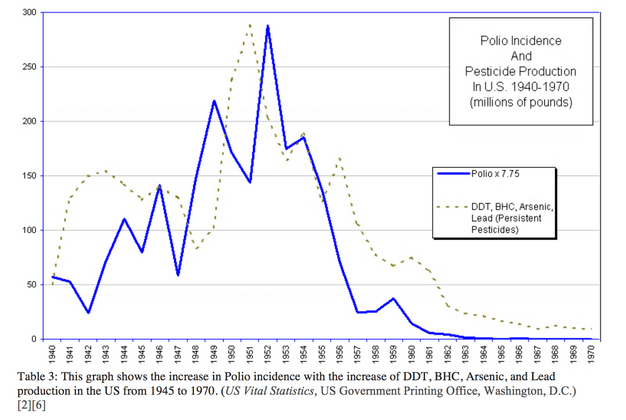 Generally, pesticide production precedes polio incidence by 1 to 2 years. The variation may be to variations in reporting methods and the time it takes to move pesticides from factory to warehouse, through distribution channels, onto the food crops and to the dinner table. A composite of these graphs, of the persistent pesticides–lead, arsenic, and the dominant organochlorines (DDT and BHC) is presented in Table 10. 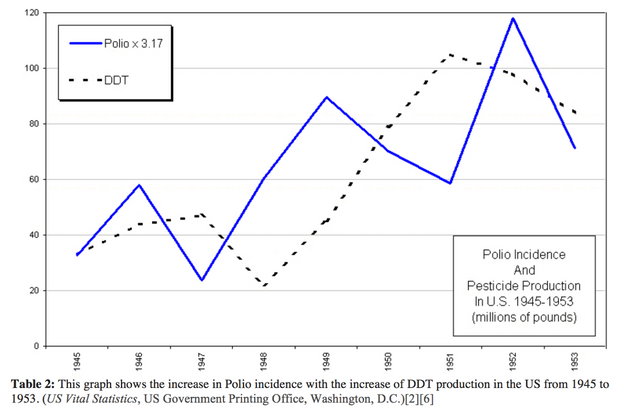 Notice that while pesticide production directly correlates with new polio cases per year through every peak and valley, the Salk vaccine enters only after Polio’s decline. (Refer to Tables 1 and 4) Salk’s point of entry is not sufficient evidence to be routinely offered as proof for the victory of vaccines over the Poliovirus, as Time implies,  and as implied by Hayes and Laws,  and virtually all other presentations of polio history in whatever media or educational forum. In 1983, via new legislation, DDT was allowed back into the U.S. marketplace, but only in pesticide blends. (100) Within only a few months of this re-entry, a new kind of polio epidemic suddenly occurred. 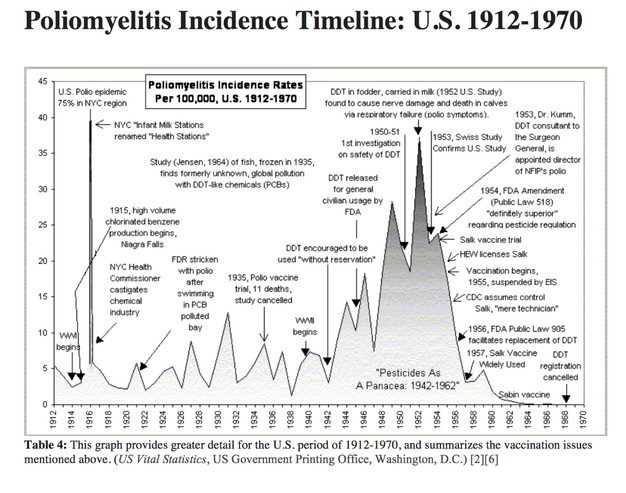 (101) It was labeled “Post-Polio”, the re-emergence of Polio symptoms in former victims. 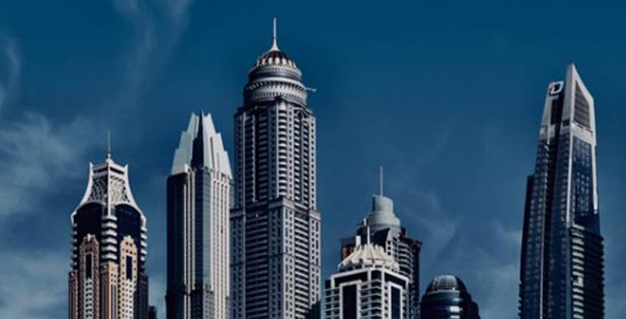 (102) This has involved approximately 600,000 victims and is shown in Table I above. Like most of the data, this correlation is not even a whisper in the mainstream media. The harsh realities of government policy are stated in Casarett and Doull’s Toxicology (1996): “Although government agencies and industry have been slow in their re-evaluation of a vast array of pesticides in use, reassessment often comes in the wake of or concomitant with some recently disclosed adverse environmental or health effect.” (104) This after-the-fact approach to pesticide poisoning is puzzling enough without questioning Casarett and Doull’s careful usage of the words: “often”, “some”, “recently”, and “disclosed”. The acidic chemical environmental correlations of “Post-Polio are overlooked. Polio images are projected as if this data doesn’t exist. It does not appear that money is being directed into these kinds of research studies. I have my own personal concerns that anyone at NYT actually wrote this article, rather that it was probably supplied to the journalist as a suggested article, to be adjusted to the author’s style, thus essentially a customized press release. 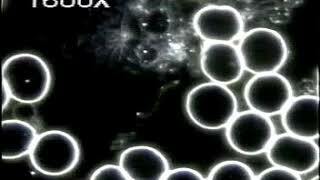 Do YOU Believe the Polio Viral Theory? Their Existence Has NEVER Been Scientifically Demonstrated!